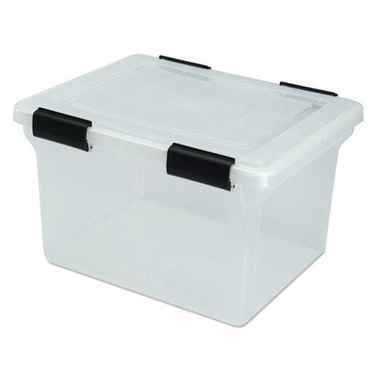 This Iris file box is one of the only airtight plastic file storage boxes made by the manufacturer. If you're looking for file boxes with lids, these plastic file boxes have black latches that create an airtight seal when the lid is in place. Get pieces of mind using this Iris file box (also called the Iris Ultimate File Box). Use Iris file box as a legal size file box or have this clear plastic file storage box hold the standard 8 x 10 letter size files. Like other products from the clear airtight line, this Iris file box has a molded lid which makes these clear plastic file boxes easier to stack. Get piece of mind knowing your important documents are in a water resistant plastic file box with the Iris file box.